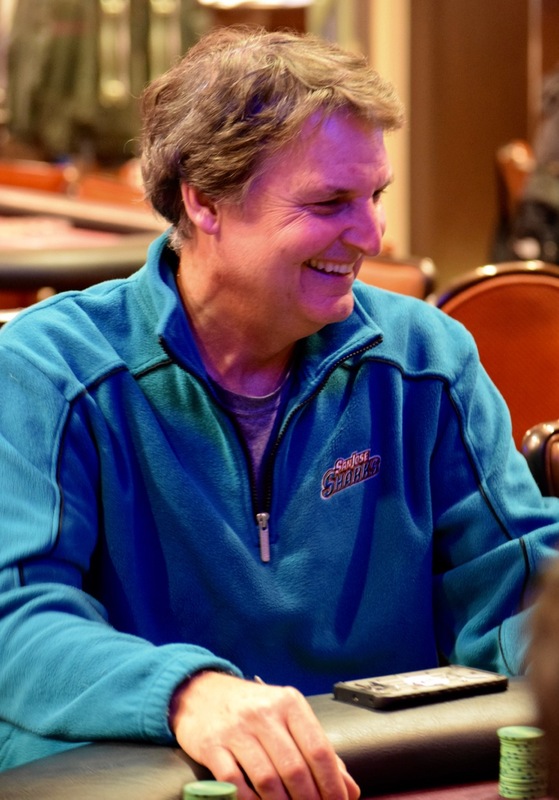 The voice of the @WSOP on @ESPN - @LonMcEachern - is here for #TVWSOPCircuit Event 4, the $365 Hold'em with a $25,000 Guarantee and only one entry per player (no re-entries). Joining Lon so far in the tourney - as Level 4 moves along - is Ben Keeline, Kevin O’Donnell, Neil Scott, Woody a Moore, Shawn Roberts, Deb Wall, Thomas Emerson, Rick Colson, Joe Muscat, JohnnyTrips Sheehan, Barry Birdwell, Lynda Hernandez, Josh Morrow, Wilton Alejandro, Carl Oliver, Ryan Liepold, Jimmy Zeledon, Jose Esparza, Ian Steinman, Jed Hoffman, Georgene and John Farmer, Carrie Diggs, Zaire Gilbert, Kathy Stahl, Kirk Rxford, Beast Valdez, George Saca, Roger Bailey, Dermot Lyons and Steve Kujubu. There's a 15-minute break at the end of this level, and another 15-minute break after level 8. Registration closes when cards go in the air to start Level 9 - being handled today by John Rochfort - Welcome back, John.